Once Cloud Assist has been installed on your computer, you will want to make sure it is open and running in the background. 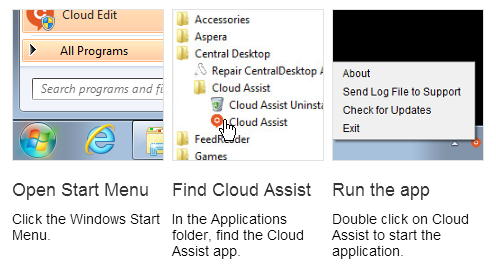 To open Cloud Assist, go to the Start menu > Programs > iMeet® Central > Cloud Assist folder > Cloud Assist to launch the application. Once running, the application should now show as an open program in your computers system tray. You may now begin opening and editing items from iMeet Central in their native applications. When viewing any uploaded item within iMeet Central, you will see an Edit icon appear next to the Download and Upload New Version buttons. Select the Edit icon to begin editing the item of your choice. You will be notified that Cloud Assist is now Downloading and Opening your document, as seen in the image below. The item should now open in its native program installed on your computer. Please note that if the appropriate application is not available within your system, the file will not open. When a file is opened via Cloud Assist, a yellow banner indicating that the file has been locked will now appear in the file details page of the file being edited. Note that files remain locked between 0 and 5 minutes after closing the application the file was opened with. To unlock the file, make any necessary changes, save, and close the application. When selecting save, you will be notified by the system icon that Cloud Assist is Saving the Document Online, as seen below. The file will then unlock once you have closed out the application in which the file was opened. You may also manually unlock the file by selecting the "unlock file" option located in the yellow banner indicating the file being locked. Any file you view within iMeet® Central that has an Edit icon is available for use with our Cloud Assist tool. Depending on the file extension type (.docx , .xlsx, .pptx, .psd, etc.) the file will open in its native program. In essence, .docx files will open with Microsoft Word, .xlsx files to open with Microsoft Excel, .pptx to open with Microsoft Powerpoint, .psd to open in Adobe Photoshop, etc.